I’ve never raved over a monitor before. As a photographer who gets a lot of work published, I am usually critical with color especially when dealing with product shots. To view and tweak the images in my digital darkroom, a really good monitor that can accurately display my images is essential. Recently, I came across the Asus ProArt PA279Q 27inch monitor. I have to say it blew me away. First of all, what attracted me to this was that it was a wide gamut monitor. Almost all monitors use the standard sRGB color space, the default color space of most digital devices. Though sRGB is the universal standard, it is limited in the range of colors it can contain. The Adobe RGB color space is recommended for publishing and more critical printing as it has a wider color gamut. When taking photos using the Adobe RGB color space, one is able to more accurately capture a broader range of colors found in real life. (More on sRGB vs Adobe RGB). 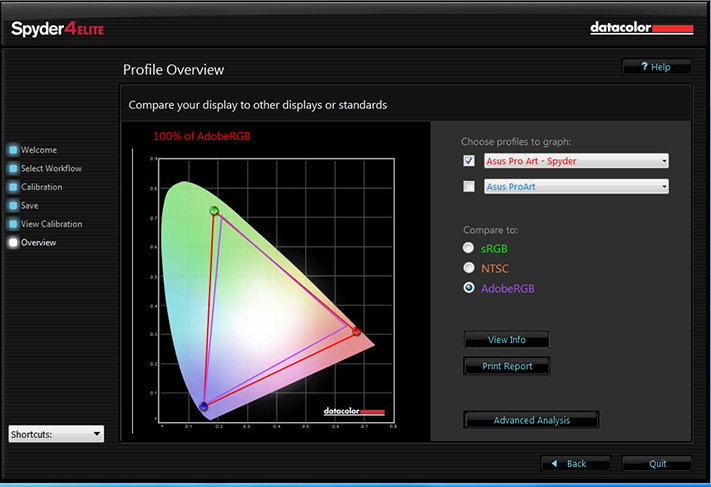 The standard sRGB monitors can’t accurately display colors outside the sRGB color space. This is where Asus ProArt PA279Q excels as it reportedly allows a 99 percent display of the whole Adobe RGB color space as well as 100 percent of the sRGB color space. In other words, if you shoot images using the Adobe RGB color space, this monitor can accurately display 99 percent of the colors you captured. I had to check this out for myself, using Datacolor’s Spyder Studio, I profiled the monitor and it registered an impressive 100 percent coverage of the Adobe RGB color space, surpassing the claim for the monitor. I did several profiling iterations and the results were consistent. Second, the monitor is pre-calibrated and comes with the ability to shift between different color space settings. It has a precalibrated Adobe RGB and sRGB mode that one can easily switch between, and user settings that one can customize and save. I decided to test it with both the Spyder Studio and X-Rite’s i1 Display Pro calibration devices and software and got excellent results. Both tests resulted in very high accuracy of color reproduction. Third, the monitor uses IPS Panel technology. A problem with a number of LCD type monitors is that shifts in viewing angles result in shifts in tone or even color. For critical color and tone correction, that becomes a nightmare as you are not exactly sure what the correct viewing angle is. IPS Panels are fantastic as they allow an extremely wide viewing angle. So even if you slouch down or shift around your desk, what you see remains consistent. Added to this, the screen is non-reflective. This reduces the risk of your screen reflecting the color of whatever shirt you are wearing and contaminating the colors you are viewing. The monitor comes with a hood to shield the screen from being hit by strong ambient light. It is a 27inch widescreen panel with a resolution of 2560x1440 providing a substantial amount of workspace. It also has 6 USB 3.0 ports, stereo speakers, and a headphone jack. It has the following video inputs: HDMI , DisplayPort 1.2, Daisy-chain DisplayPort Output, and Dual-link DVI-D. It is capable of displaying images from two sources simultaneously and allows picture in picture, or picture by picture displays. It also has an interesting new feature, Quick Fit Virtual Scale function. This allows an overlay display of various document and photo sizes to enable one to evaluate images in their actual print sizes prior to printing. There are so many other interesting features and customizable settings that makes this monitor a superb tool for viewing and editing our images. Pardon if I sounded like a salesman, but I’m just excited that monitor technology has finally started to catch up with camera and printer technology and is now reaching our local market.